In a decision that may have an impact on the planned update of Bellingham’s accessory dwelling unit (ADU) ordinance in 2017, Sue Tanner, the hearing examiner in Seattle, remanded to the Office of Planning and Community Development (OPCD) for further work their environmental impact Determination of Non-Significance (DNS) on the SEPA Environmental Checklist prepared for an update to Seattle’s ADU ordinance . Although the decision is not binding on Bellingham, aspects of the hearing examiner’s decision should have an indirect effect on the decision process on ADUs here. 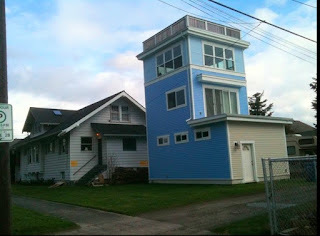 As reported in the Seattle Times, “Seattle must halt a proposal to allow more and larger backyard cottages in order to conduct a more thorough review of potential environmental consequences, including the possibility that it could lead to gentrification.” Tanner’s decision states, ““The record demonstrates that the challenged DNS (determination of non-significance) was not based on information sufficient to evaluate the proposal’s impacts…” In fact, most of the questions in the SEPA checklist are answered “not applicable”. To think that the SEPA statement provides any useful information whatsoever in determining the long-term effects of the creation of ADUs in all of Seattle’s single family zoned areas is a risible notion. As in Bellingham, certain ADUs are already allowed in the city of Seattle. 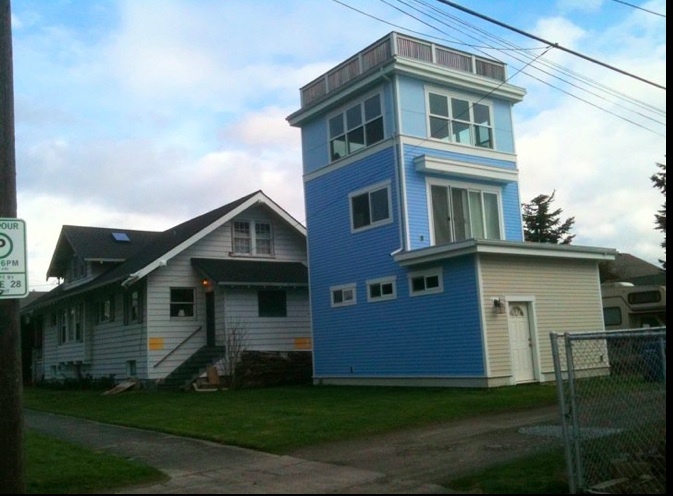 The Seattle ordinance would greatly expand their use by allowing ADUs on smaller lots and even allow building of a cottage and an ADU on single lot, thus creating three dwelling units on a single family zoned property. The hearing examiner also found that the OPCD was not only the proponent but also the decision maker on the DNS, a clear conflict. Not surprisingly, the same issues raised by Bellingham citizens during the Comprehensive Plan update this year were in play in the Seattle decision. These issues are the impact of parking, affordability, gentrification, public services/utilities, height/bulk/scale and lifetime effects. The examiner found that these aspects were not sufficiently studied. Here, the city can expect a substantial push-back by citizens who, although generally supportive of carefully planned use of ADUs, suspect that Bellingham’s ADU ordinance update may be used to effectively eliminate single family zoning creating severe negative effects on the character of neighborhoods. The year 2017 may prove to be an interesting one for housing and land use decisions. Durham, NH Where Rental Inspections Worked! 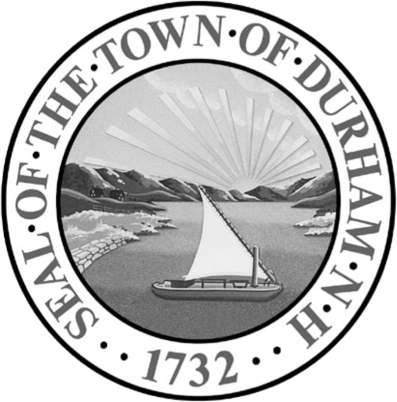 "The DLA [Durham Landlord Association] has also argued that it is the non-owner occupied, single family rentals managed by non-professional landlords that represent the problem properties in terms of safety concerns in Durham. The new inspection program does not bear out that contention. Rental properties of all types have been found deficient in meeting fire/safety standards." 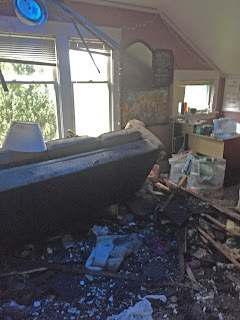 "Inspection results have substantiated the long-held concerns of the Town’s Code Enforcement Department, Fire Department, Assessing Office, and some members of the Rental Housing Commission – that many rental properties in town do not meet basic health and safety standards as required by state statute putting young and inexperienced, largely college-aged tenants in harms way." 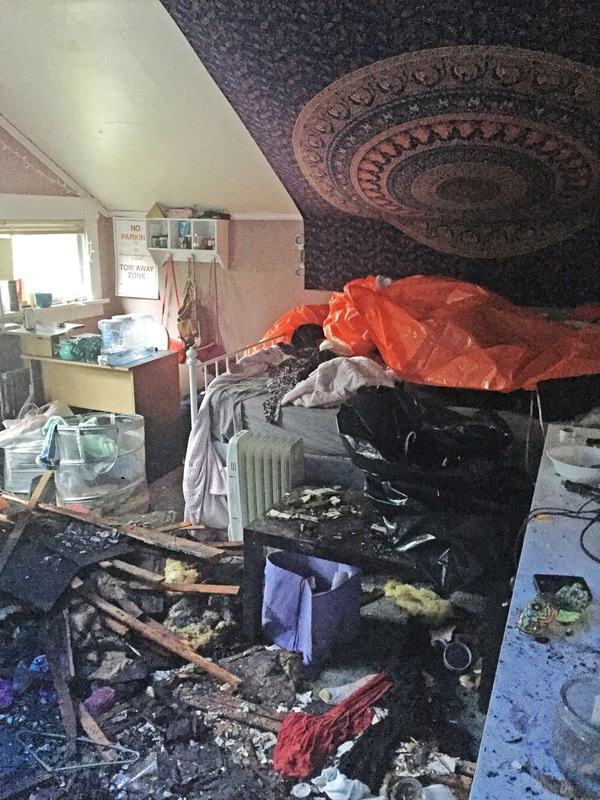 "Between 2013 and today, a total of 1,784 inspections [bolding mine] have taken place within off campus rental dwelling units (apartments) by the inspection division at the Durham Fire Department. The Fire Department staff has found 4,021 violations [bolding mine] to date, of which 3,213 have been addressed by owners. 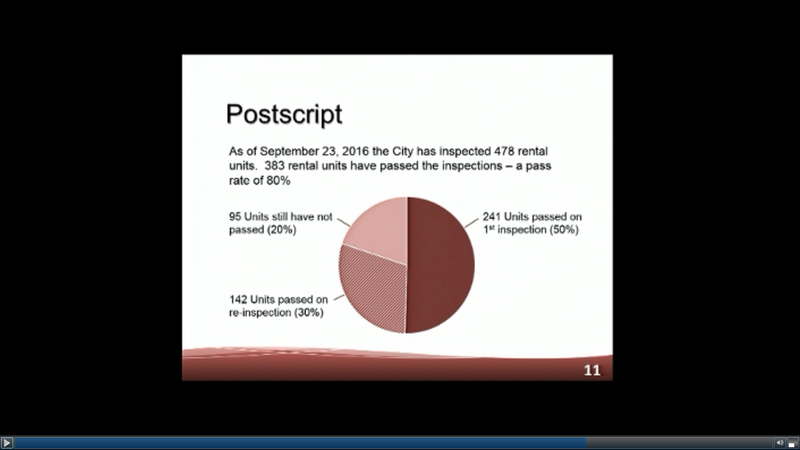 There are 808 outstanding issues for which re-inspections are required/pending. Durham's Housing Standards Ordinance is serving the purpose for which it was intended -- to make living conditions much safer for inexperienced students as well as adult tenants living off campus in the broader community." That sounds like a successful program in a university city. As in Bellingham, landlords tried unsuccessfully to fight inspections by creating uncertainty about the legality under the 4th Amendment of the US Constitution that spells out the need for warrants for searches and seizures. This specious argument has nothing to do with entering dwelling units for safety and health reasons. In Washington state, landlords already have the right to enter rental units after giving notice. It is ludicrous to posit that a city health and safety inspector operating as an agent of the municipality does not have a similar ability to enter a rental unit with notice. Washington state law also allows issuing administrative warrants to enter units where a tenant or a landlord has refused access. Rental inspectors are just not breaking down doors to find a tenant in his skivvies.